I've been meaning to get to this for a bit but life has had other plans (as usual). Jay Shelton has picked up a couple unopened boxes recently and sent me photos and statistics. 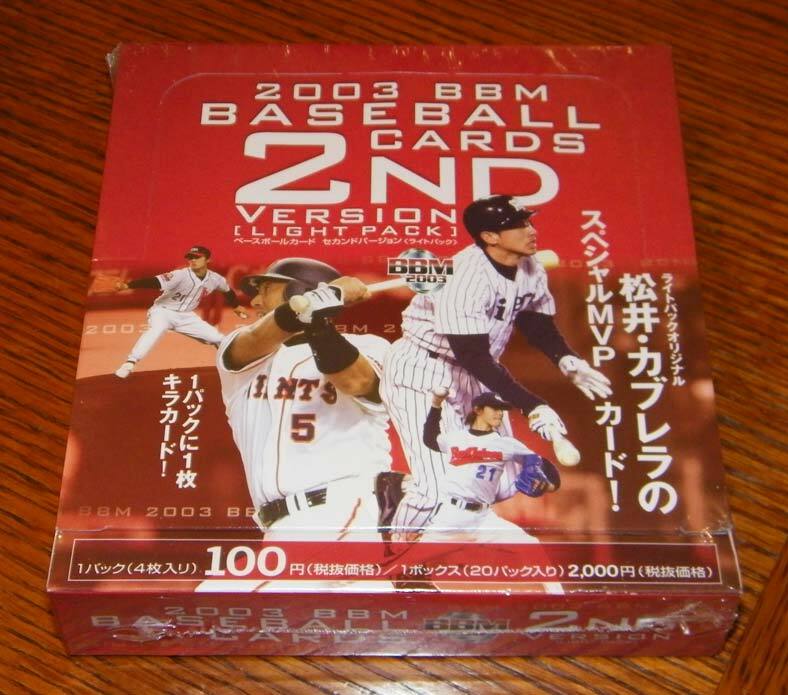 First up is a "light pack" box from the 2003 BBM 1st Version set. 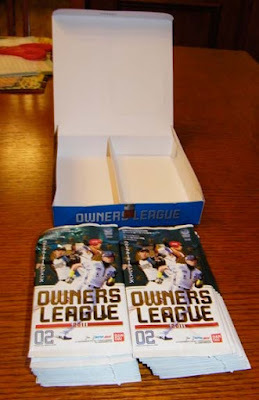 I've talked about the "Light Pack" boxes a bit in the past but in a nutshell they are packs with half the number of cards than the regular packs at an MSRP of half the price. 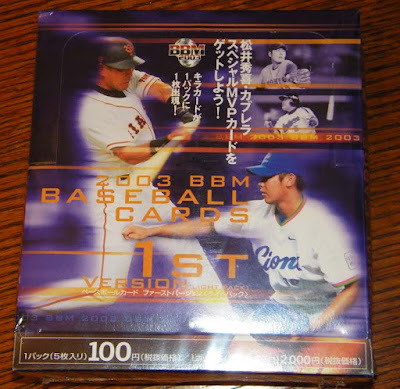 In the case of the 2003 1st Version set, the packs contained 5 cards at a price of 100 yen a pack rather than the standard 10 cards for 200 yen a pack. The "Light Pack" boxes contained only a subset of the base set (only the player cards and the Leader subset) and none of the parallels, insert cards or memorabilia cards available in the "standard" boxes, but there were parallels and insert cards that were only found in the "Light Pack" boxes. For the 2003 1st Version set, 60 of the player cards had "kira" parallels and all the Leader subset cards have a "silver" parallel. There was also a 2 card "MVP" insert set featuring the 2002 MVPs (Hideki Matsui and Alex Cabrera). (More details and examples can be seen here). 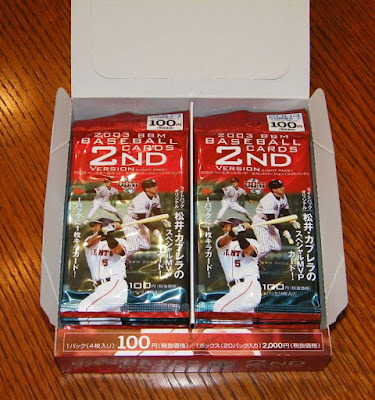 The box contained 20 packs total. As I mentioned above, each pack had five cards. Of those five cards, one of them was either a "kira" card or a "silver" Leader card. I'm not sure that any non-"silver" Leader cards were actually available in the boxes. So there's 100 cards in the box. Jay got 88 unique cards plus 12 doubles. 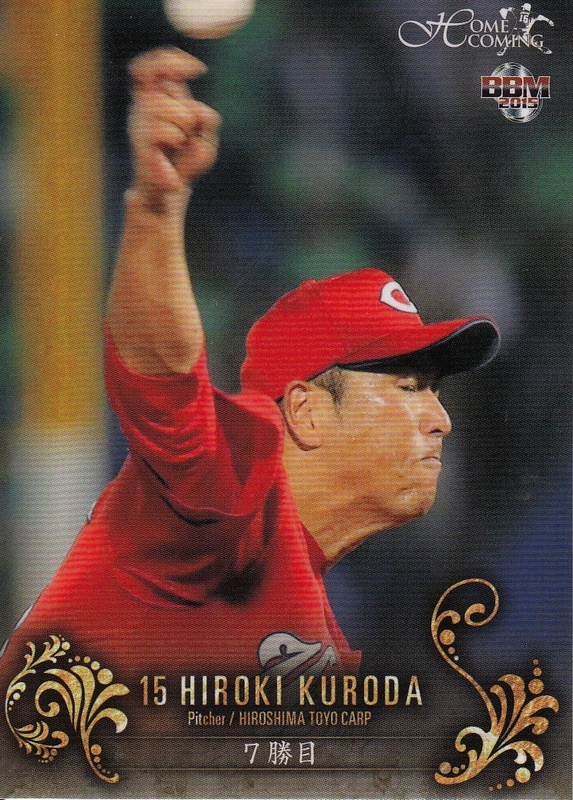 Of the 88 cards, 70 were player cards, nine were "kira" parallels and nine were "silver" Leader cards. Of the 12 doubles, one was a "silver" Leader card, one was a "kira" parallel and the rest were regular cards. 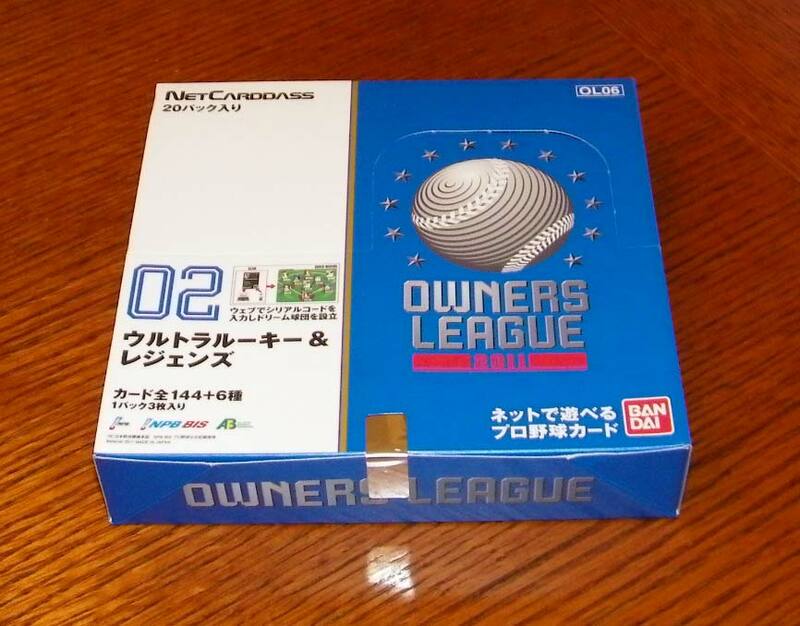 The final box Jay opened was from one of the 2011 Bandai Owners League sets. I think that Bandai issues four of these sets a year. The 2010 ones were labeled 01-04, the 2011 ones were labeled 05-08, etc. 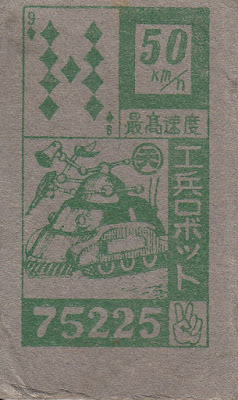 This is from the set labeled "06" so I think it was the second one issued in 2011. 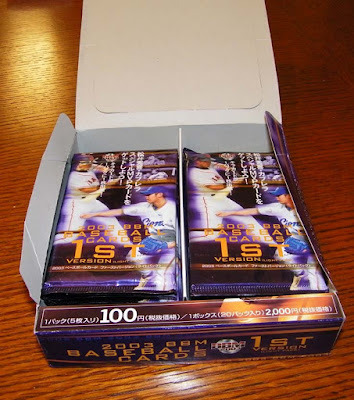 There were 20 3 card packs in the box for a total of 60 cards. Of those 60 cards, Jay got 58 unique cards. There were 144 cards in the set but some of them are short printed. There are at least two different types of short print - "Star" and "Super Star". 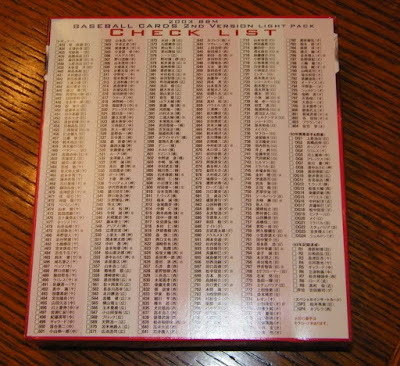 Of the 58 unique cards Jay got, 49 were "regular" card, five were "Star" cards and four were "Super Star" cards. The "regular" cards could have either a black or white border - I don't know if there's some significance to that. Thanks for the information and pictures Jay! Ryan had mentioned in a comment a while back that it's not uncommon for unlicensed cards to be made today using all sorts of available images. I guess this has been going on for quite a while. I need to go back and check all the high end issues and see if any of the other uniforms I didn't have coverage for are represented there. I love getting packages in the mail from Ryan of This Card Is Cool. Ryan is always on the lookout for stuff for me and he's pretty good about finding it. And sometimes he picks up stuff that he figures I'd be interested in, even if I haven't said anything. And he's usually right - I am interested in it. So packages from Ryan always contain good stuff - some things that I know I'm getting and some things that are a surprise. 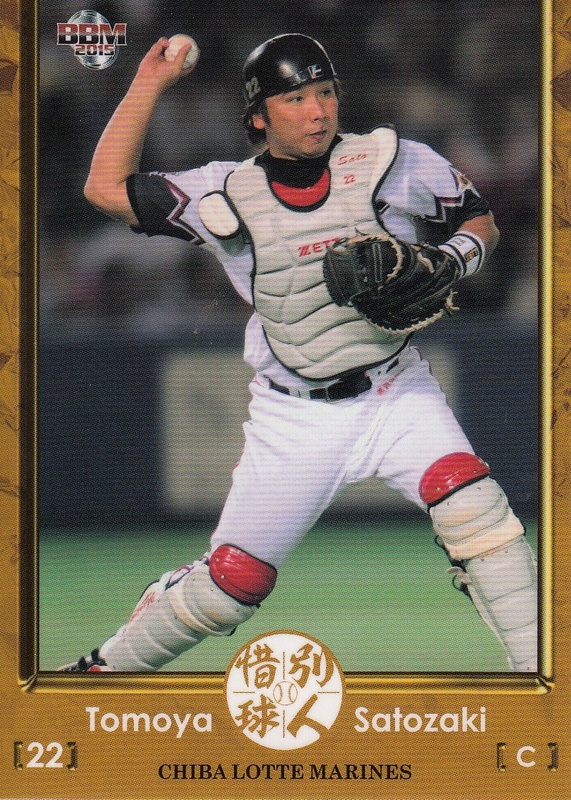 The card of Akahoshi is especially cool as it is one of the rare "pre-rookie" cards of a player in Japan. 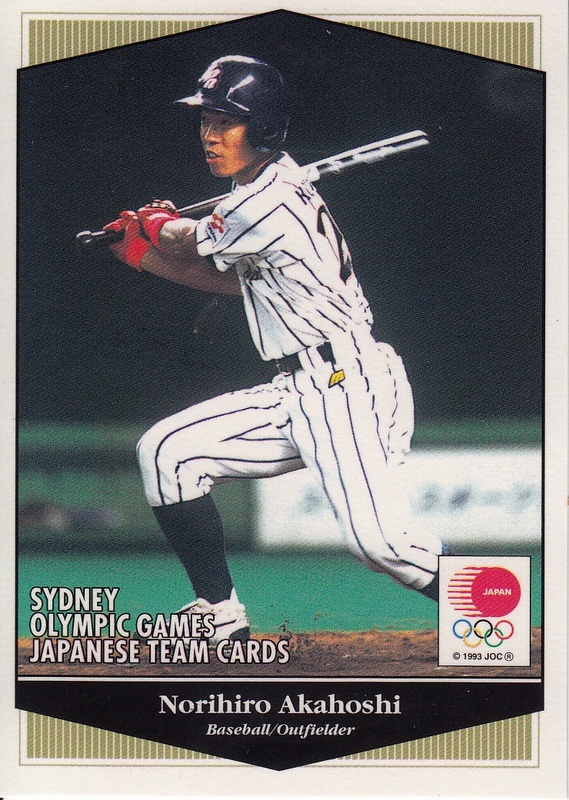 Akahoshi was playing for JR East of the industrial leagues when he was selected for the Olympic team - he wasn't drafted by the Tigers until October of 2000. I ask Ryan to track down opened box sets for me as they can generally be had extremely cheaply - frequently 500 yen or less - but that price skyrockets when I have to pay kuboTEN fees. Ryan found three box sets for me - one he'd been looking for for most of 2015 but the other two were released late in the year. In January of every year since 2011 BBM has published a box set commemorating the players who have retired during the previous year. I usually refer to this set as "Farewell" but the translation of the title is more along the lines of "Regret at Parting Ball Players". 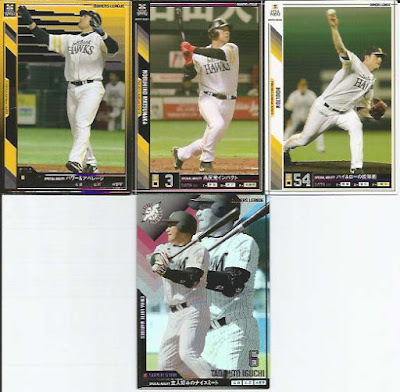 Last year's set contained 36 cards celebrating the careers of 32 players (four players - Atsunori Inaba, Makoto Kaneko, Alex Ramirez and Tomoya Satozaki - had two cards each in the set). 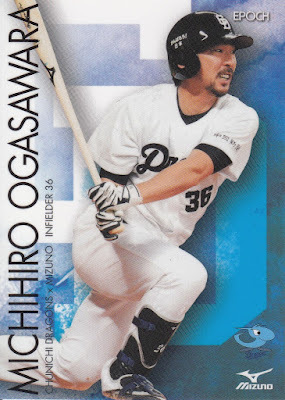 The photos in the set are usually action shots from when the player was active (and may be from a year previous to last year) or from their retirement ceremony. 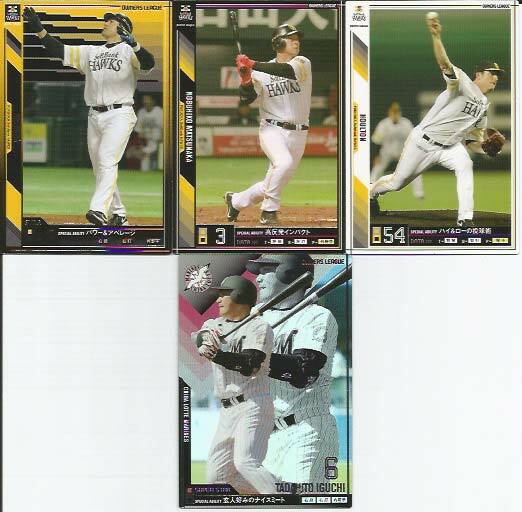 Beyond the players mentioned already, the set includes cards for Masao Kida, Shugo Fujii, GG Satoh, Yoshinori Tateyama and Tomochika Tsuboi. 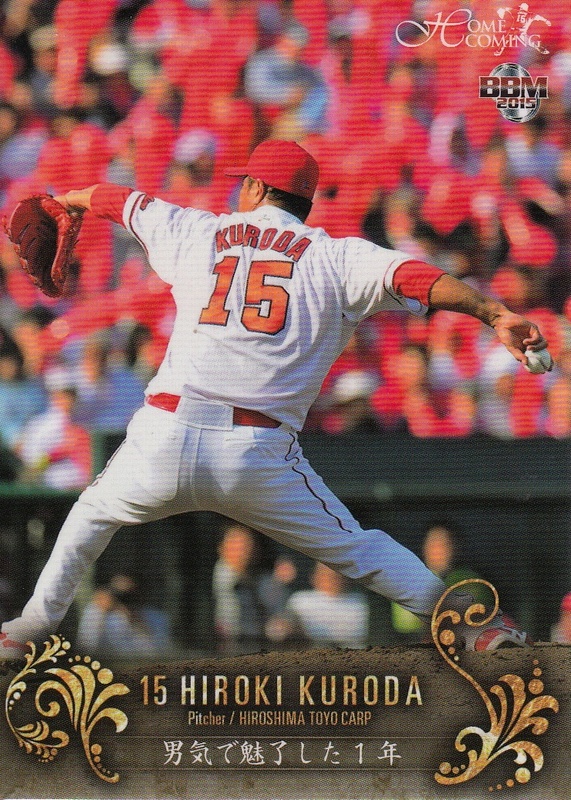 Hrioki Kuroda's return to Japan and the Hiroshima Toyo Carp last year was documented in a box set called "Homecoming" that was released in November. 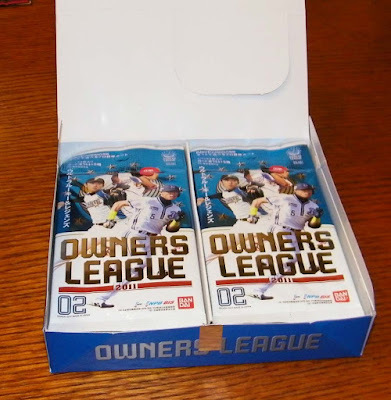 It's an 18 card set and each card appears to commemorate some event from the 2015 season. 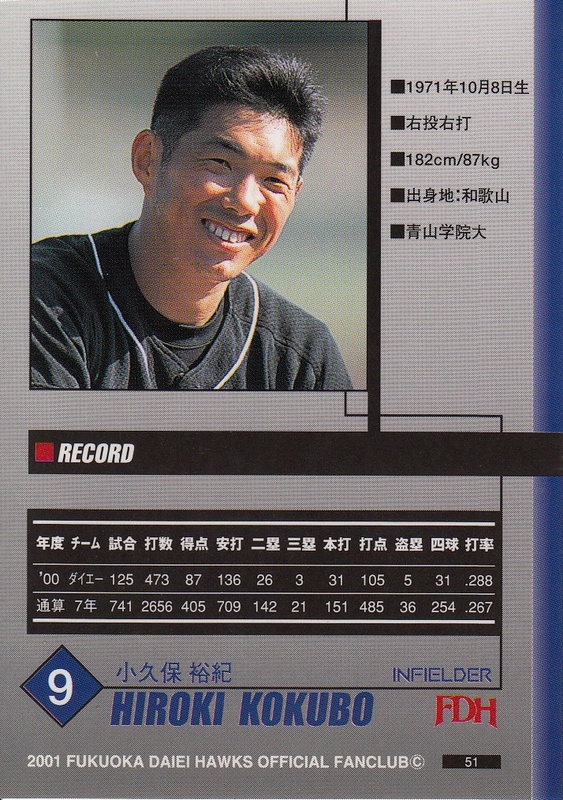 There's a card for each of the 11 wins he got and for reaching some milestones (like his 500th game between MLB and NPB). Epoch published a Dragons box set in November as some sort of cross promotion with Mizuno. 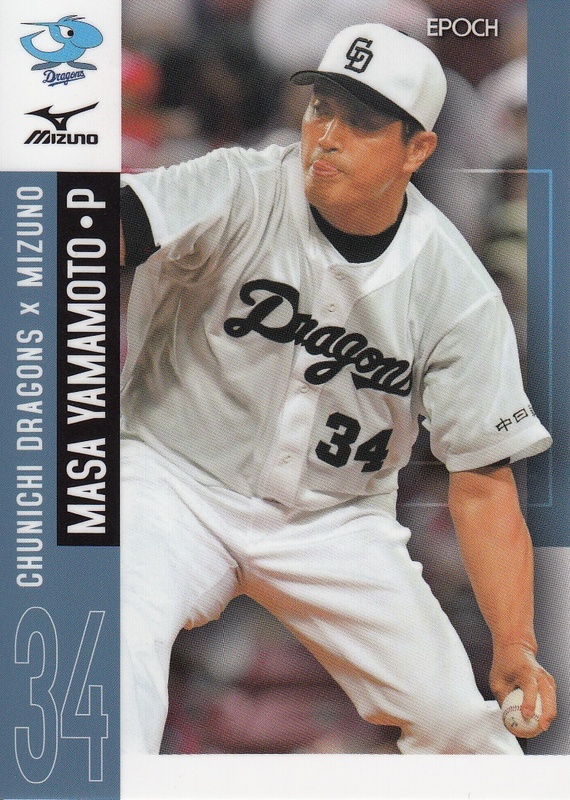 The set was called "Chunichi Dragons X Mizuno" and was very similar to some similarly named sets that Front Runner put out in 2014. 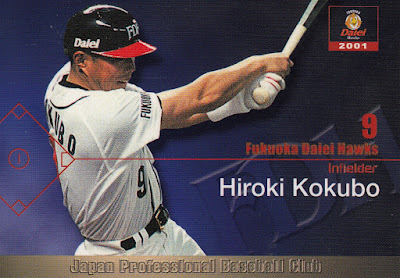 In fact the "R" symbol to indicate a rookie was identical in this set to the symbol used on the Front Runner cards. The set has 24 cards but only featured 12 players. 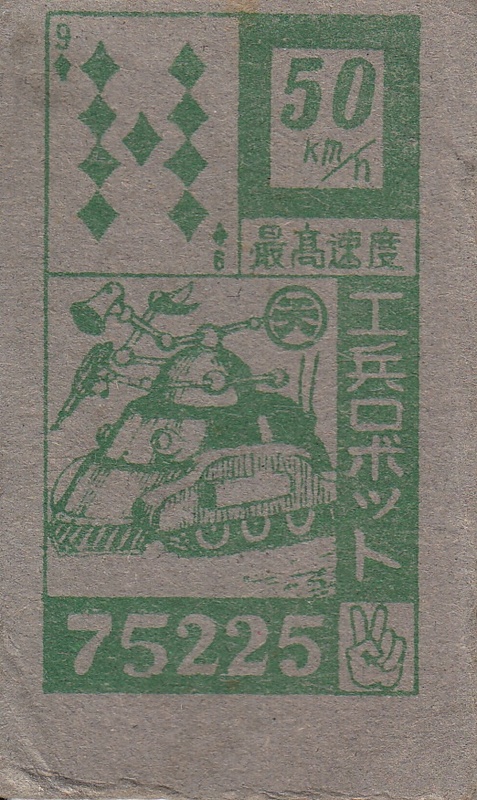 Each player has two cards in the set. 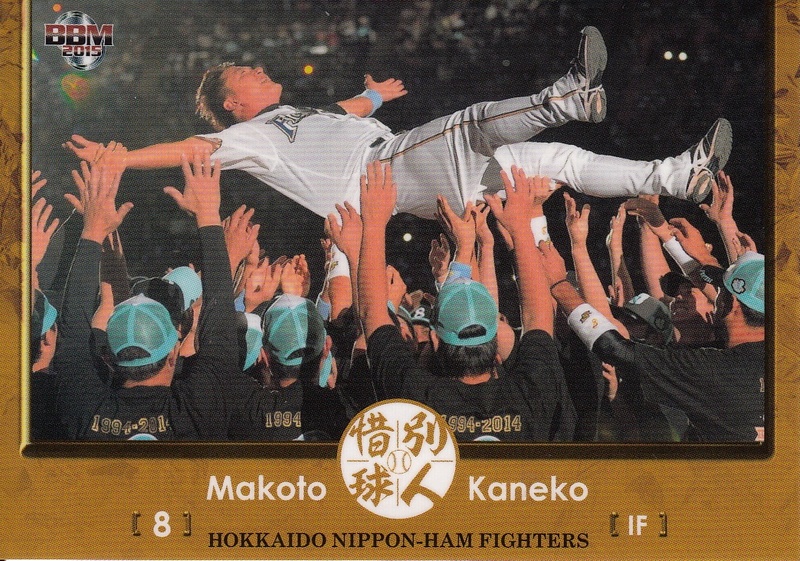 The set includes Masahiro Yamamoto, Kazuhiro Wada, Michihiro Ogasawara, Masahiro Araki, Takuya Asao and Daisuke Yamai. 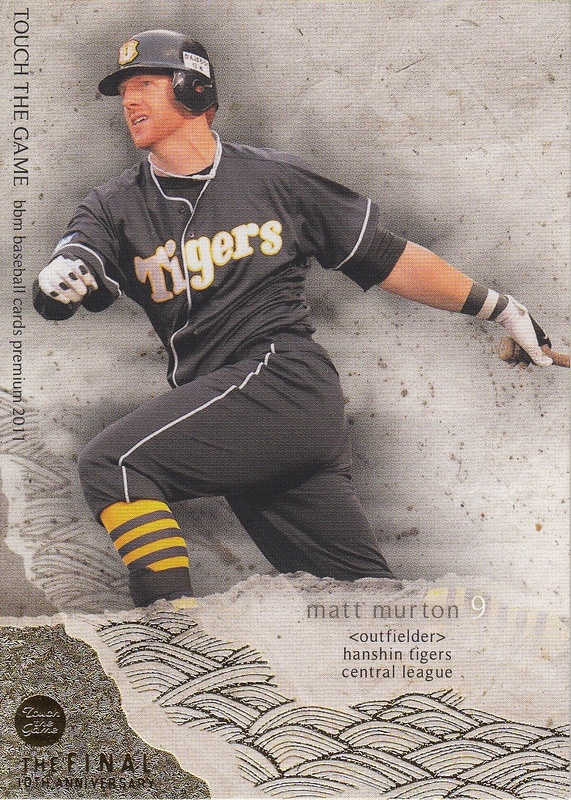 Lastly, Ryan included a handful of loose cards from a couple Front Runner box sets that I didn't have. 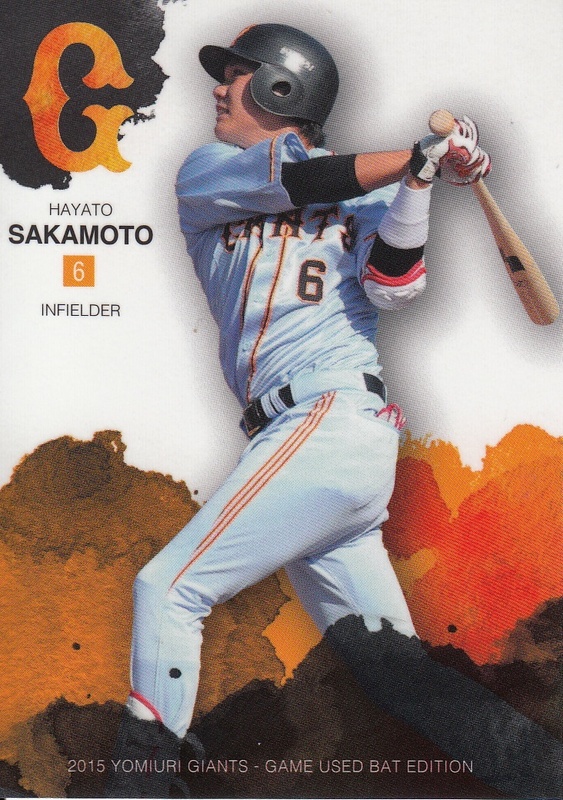 He sent four cards from the 2014 Lions Signature Edition set (including one of Takeya Nakamura, one of my favorite players) and ten cards from the 2015 Giants Game Used Bat set (which was similar to the Dragons X Mizuno set in that it had two cards for each player in the set). Ryan sent out a number of packages when he was back in the States. Jason got some cool stuff from him as well. Thanks as always Ryan! And let me know what I owe you for these! I want to quickly mention that I got a couple cards from the 2001 Fukuoka Daiei Hawks Official Fan Club card set. 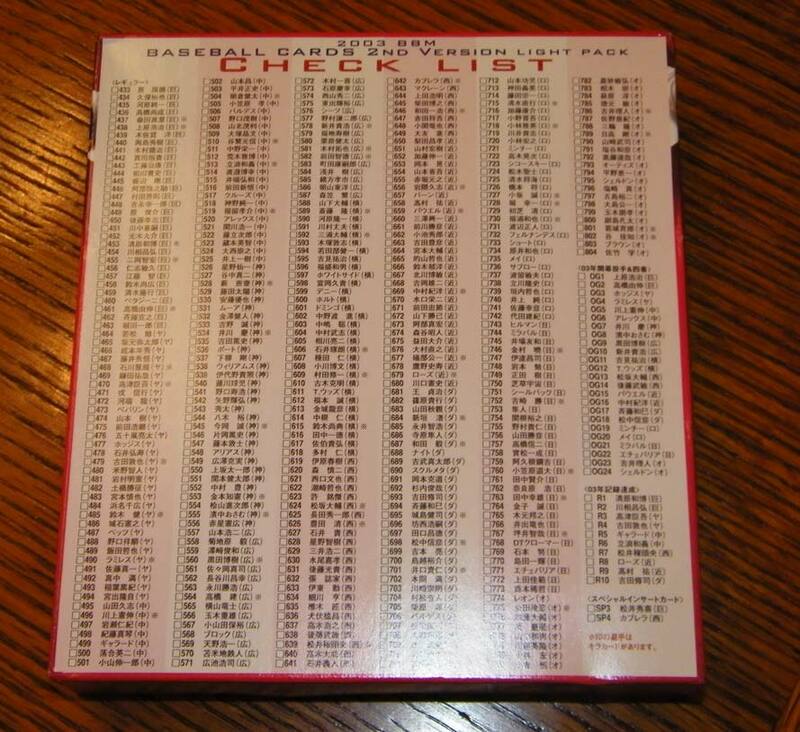 Jason listed eight of these in his mongo team issue post from a few years back but the four I got aren't on the list. 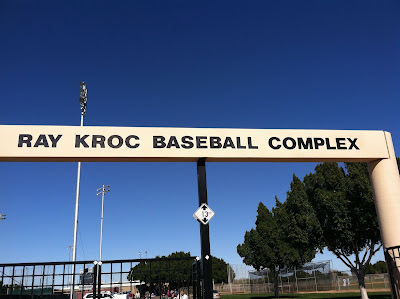 I did a little research and I discovered that what is now called the Ray Kroc Baseball Complex was the original spring training home of the San Diego Padres. 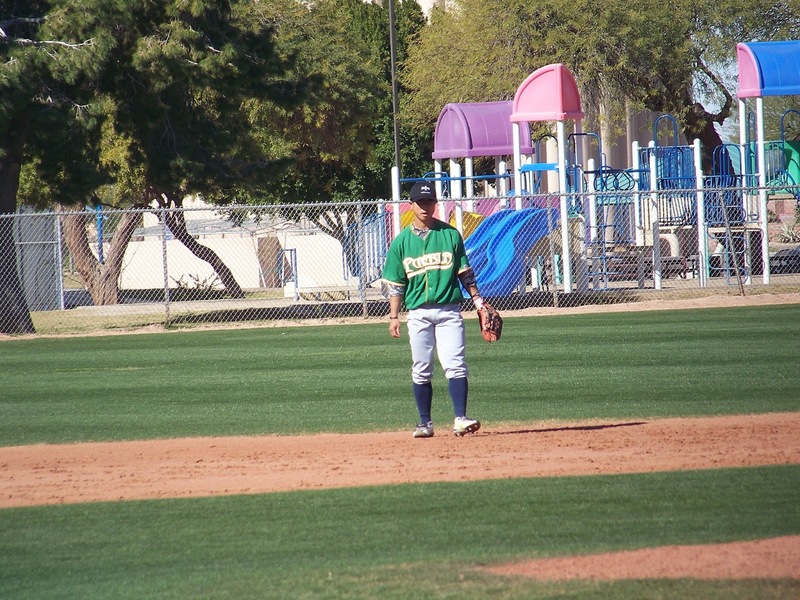 In some ways Yuma was an idea spring training home for the team as it's only 170 miles east of San Diego - pretty much all on Interstate 8. 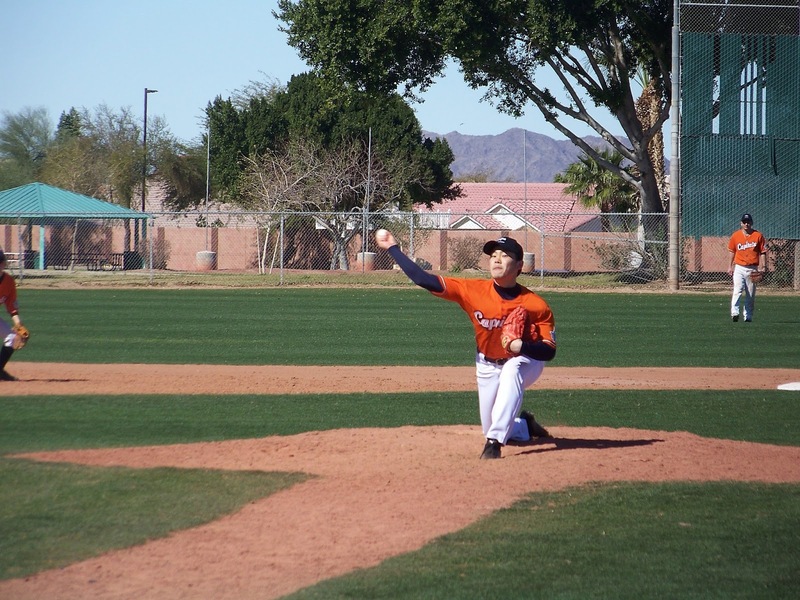 Unfortunately it's also about 170 miles from Phoenix where most of the rest of the Cactus League trained which made for long road trips for the team so after 1993, the team moved to a new spring training home at the Peoria Sports Complex near Phoenix, the same facilities that the Fighters used earlier this month. 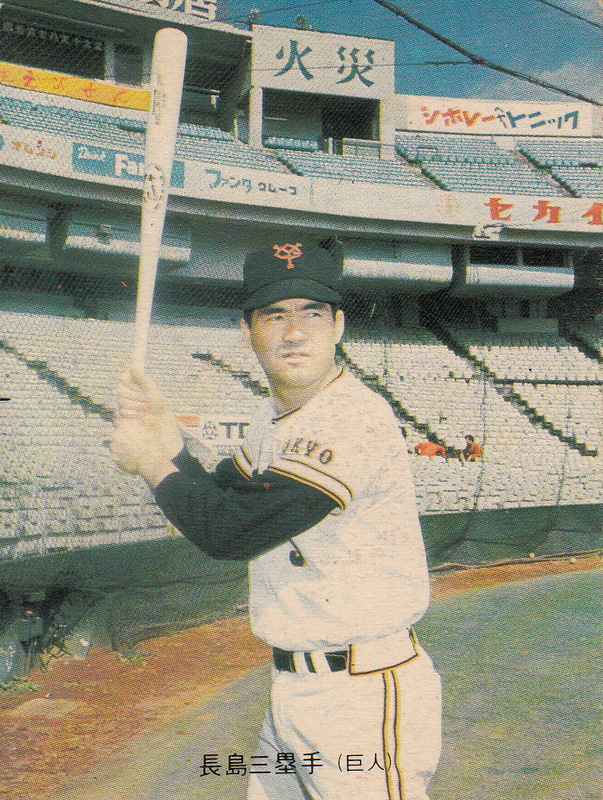 After doing a little more research I discovered that the Padres were well acquainted with sharing their spring training facilities with a Japanese team. 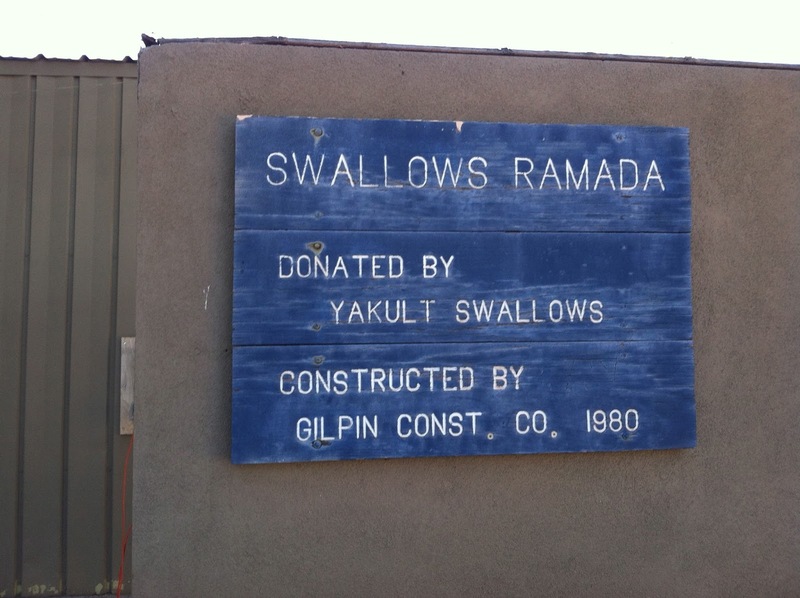 The Swallows had trained in Yuma for about 20 years, from the late 1970's until the late 1990's. That picture of Furuta could have been taken any year from 1990 (his rookie season) until 1998 (the Swallows' last year in Yuma) - although the thick red cuff on his jersey identifies a style the Swallows wore from 1990 to 1993 so I can narrow it down a little more. Armed with this knowledge, I thought it would be fun to drive out to the complex (if it still existed) and get a picture of the water tower (if it still existed) from the same perspective. If nothing else I figured I could get a "Card Of The Week" post out of it (despite having already used this card in one last year). It turns out that the complex (and the water tower) still exist so on the first Sunday that I was in town, I drove over to get a picture. As you can see, I got the picture of the water tower. But as you can also see, the field was in use. 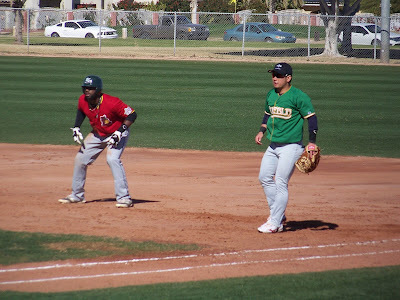 I had noticed, of course, that there were a bunch of players on the field as I walked up and I briefly wondered if one of the Korean teams that I had heard was training in Arizona was actually training in Yuma rather than Phoenix or Tucson. I stopped someone kind of official looking and asked what the players were there for. 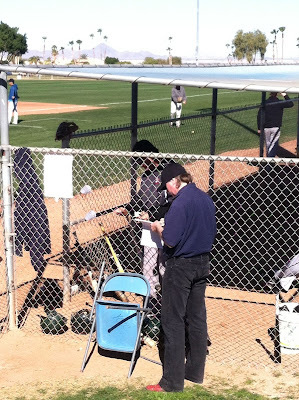 I was told that it was spring training for the Arizona Winter League which, of course, lead to a whole bunch of other questions. In a nutshell, the Arizona Winter League is essentially an extended tryout camp for unsigned players. 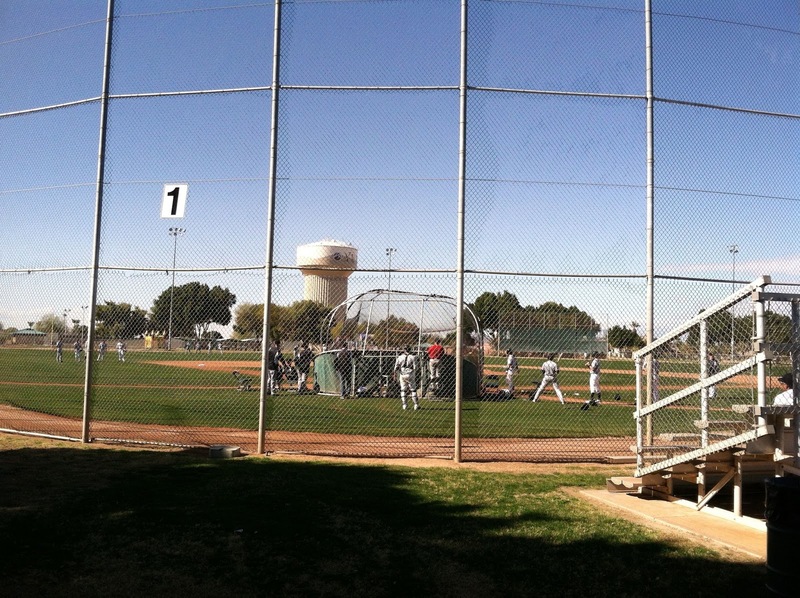 There were a hundred or so players on the fields of the complex, working out for a number of coaches. After two days of workouts, the players would be "drafted" into six teams that would play a 17 game season between February 3rd and the 24th which would allow scouts to view the players in game situations. 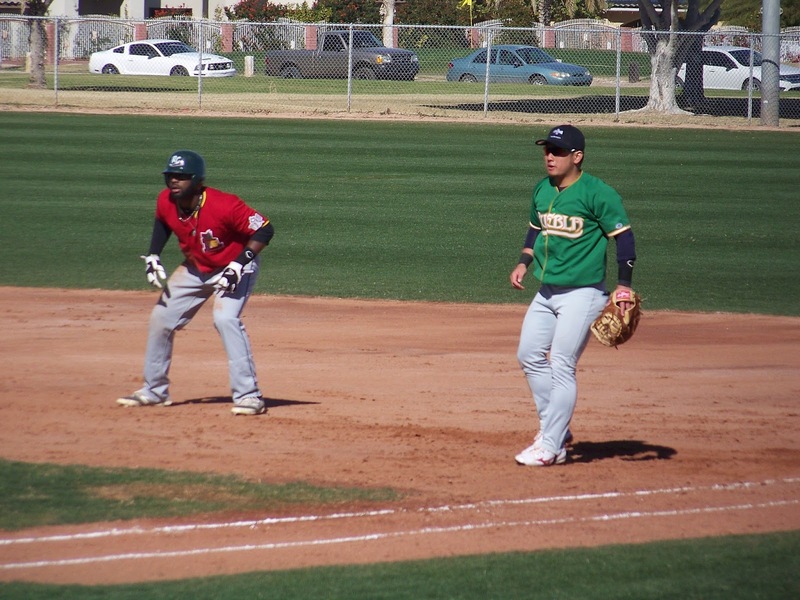 The six teams were somewhat misleading named the Edmonton Capitals, the El Paso Tejanos, the Laredo Apaches, the Pericos de Puebla, Team Canada and the Yuma Wranglers. I say misleadingly as obviously no one was playing any home games anywhere but Yuma and Team Canada actually had no Canadians on it. I kind of got the feeling that the six teams were basically what uniforms the league had available. The players for the league come from a wide variety of backgrounds. A few have experience in major league organizations, a few more have some experience in the independent minors while the vast majority of them are former college and high school players. There are a couple 19 year olds and two pitchers in their 40's but most of the players appear to be in their mid to late 20s. 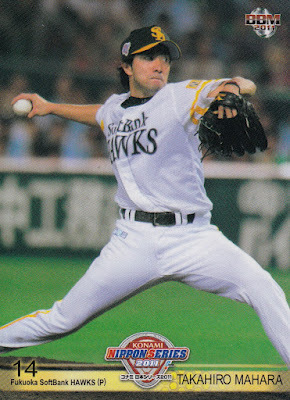 The only name that seemed vaguely familiar to me was Todd Gossage whose father is Hall Of Fame (and former Fukuoka Daiei Hawk) pitcher Rich Gossage. 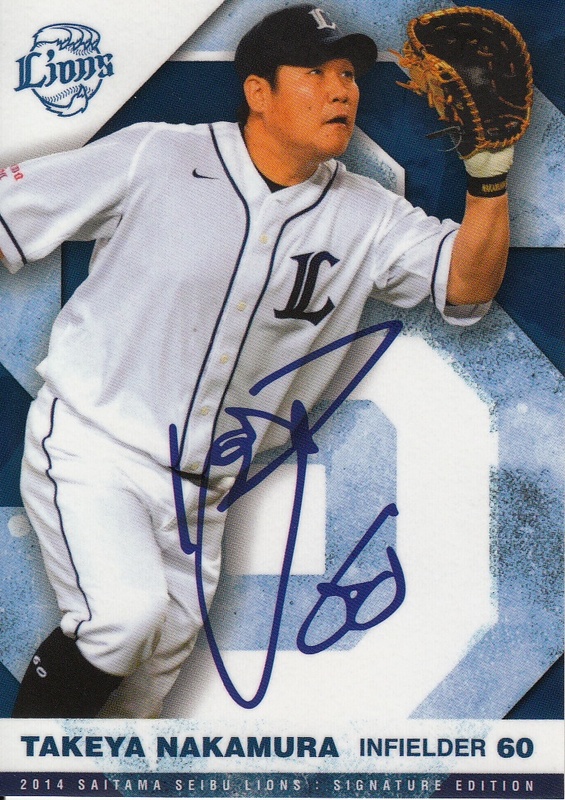 Some of the players had been through the Arizona Winter League in previous years (the league has actually played every year since 2007 although I believe the last two were actually held in San Antonio, not Yuma). What I was most intrigued about the league was that there were a handful of Japanese players involved. 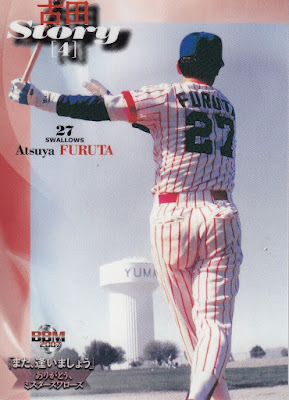 Once the rosters were published, I quickly went through them to see if there were any familiar names, any former NPB player trying to continue his career in America? I was disabused of this pretty quickly. None of the names looked familiar and none of them had spent any time in NPB, at least according to Baseball-Reference. I asked Deanna Rubin to take a look figuring if anyone was going to know who any of these guys were, it would be her. She didn't recognize anyone off the top of her head but she did a little bit of research and found some information about some of the guys. With Deanna's help, I've found out a little about a couple of these guys. Naoki Hashimoto made 13 appearances with the Indians Arizona League team in 2013 and 2014. His Japanese Wikipedia page says that he went to PL Gakuen high school (becoming the ace pitcher after Kenta Maeda was drafted), dropped out to join the NOMO baseball team, went to Hannan University for a couple years before dropping out to join the Kobe Sands of the Kansai Independent League in 2012. After spending most of 2013 with the Indians, he pitched in one game for the Kishu Rangers, also from the Kansai Independent League. 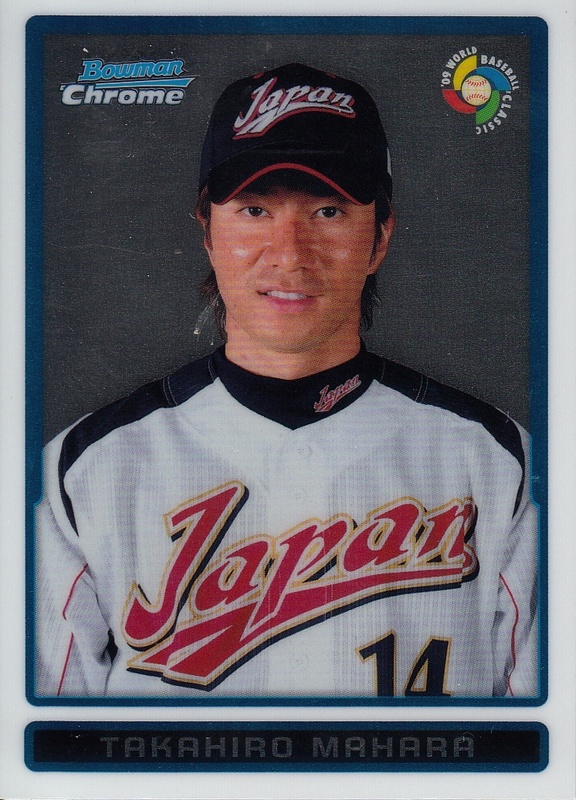 He returned to the Indians for only one game in 2014, then joined the Fukui Miracle Elephants of the Baseball Challenge (BC) League. He spent 2015 with the 06Bulls of the Baseball First League. 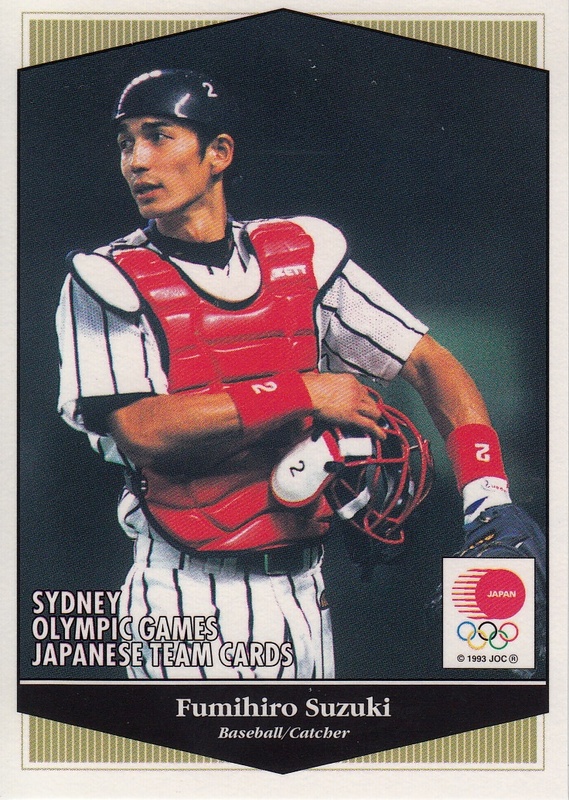 It looks like he failed a tryout with the Kagawa Olive Guyners of the Shikoku Island League last fall. Tatsuhiro Kunimoto appeared in one game in his four years at Keio University - he did not get an at bat. Naomichi Sugi is another former NOMO baseball team member in addition to his stints with Niigata and Fukui. 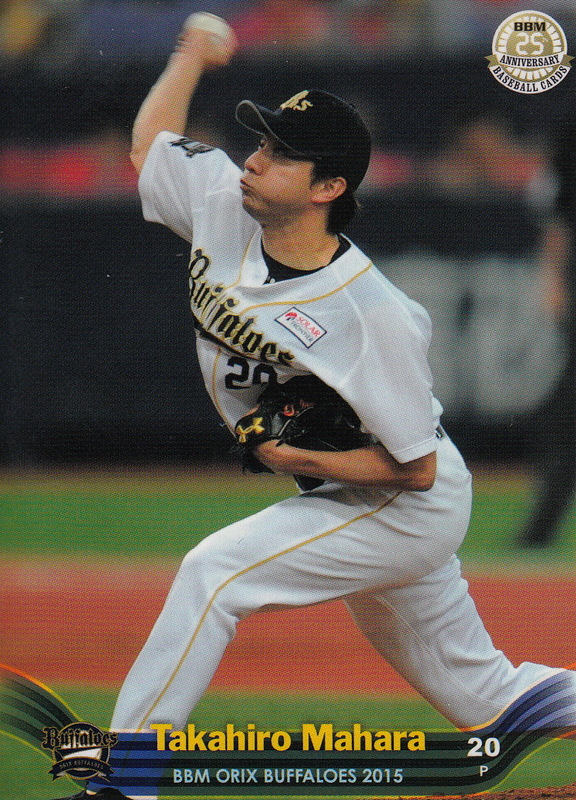 I found 2013 stats for Satoru Kusama with both Clackamas Community College and the Portland Toros of something called the West Coast League Portland. Kazuaki Aoyama, Takanori Machita and Yoshimitsu Muraki are all in their late 30's and I wonder if they are all industrial league veterans who decided to try their luck over here. There are three games played every day. 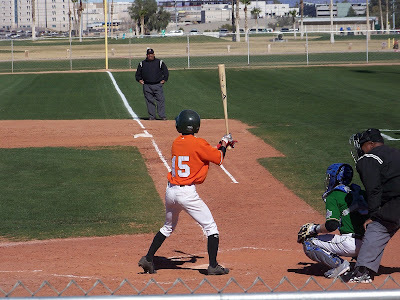 There are two games in the morning (10 AM during the week and 11 AM on the weekend) and one game in the afternoon (1 PM during the week and 2 PM on the weekend officially but the afternoon game usually starts soon after the morning game ends). My work schedule for the week the league started originally looked like it was going to accommodate going to the morning games as I didn't need to be at work until 3 PM that week but I ended up only getting to games on February 3rd (Opening Day) and February 6th. 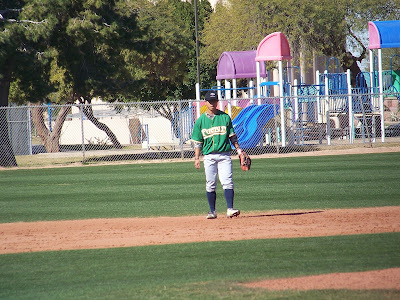 I needed to come in early on the 4th and 5th, the league was off on the 7th and I left Yuma on the 8th. 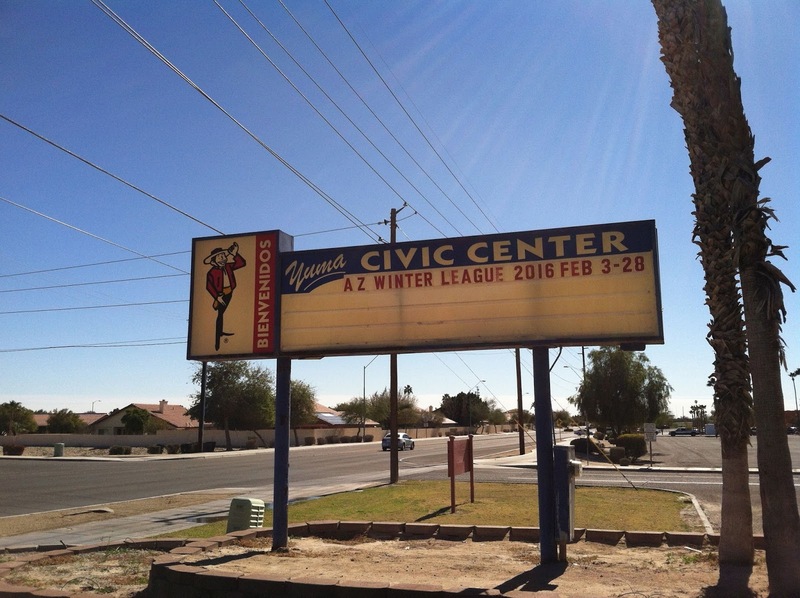 I mentioned before that the league had spent the last two years in Texas rather than Yuma. 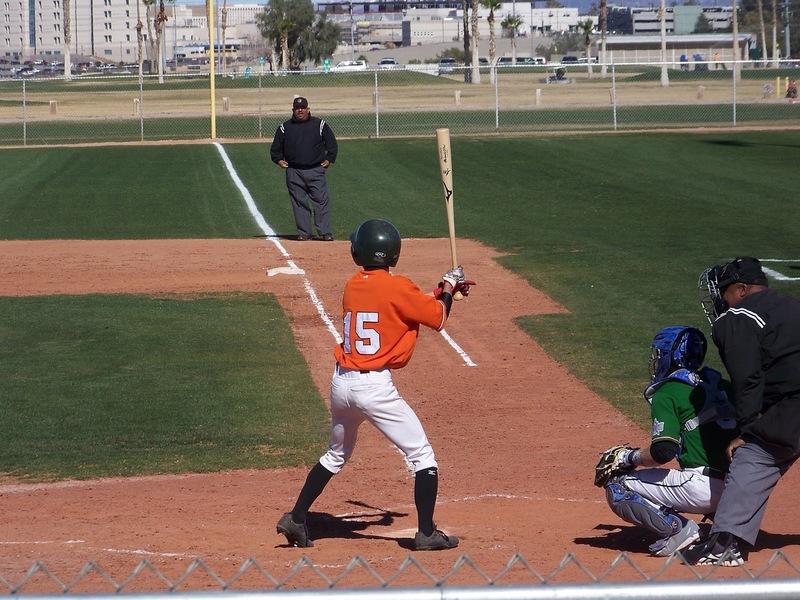 While the league was gone, Desert Sun Stadium, the main ballpark at the complex was converted into a soccer stadium. From what the office manager for the league told me, it sounded like the outfit that converted the stadium to soccer had intended to bring a team to Yuma but had gone bankrupt before it happened. So now there's a very nice soccer stadium that no one is using and the AWL had to play on a couple of the practice fields that were only maybe a hundred feet apart. Foul balls from one game could (and did) land on the field of the other. 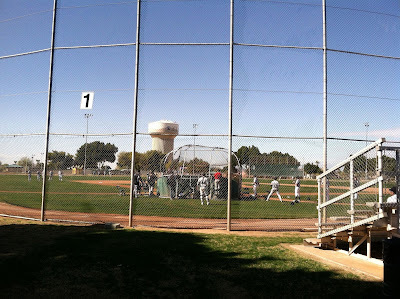 The stands were small metal bleachers with maybe five benches placed behind the foul screen between the dugouts and home plate. Tickets for the games were $5 or you could buy a season pass for $20. Considering the facilities they weren't drawing too badly. 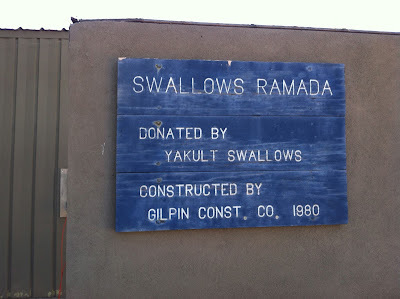 Yuma has a large population of snowbirds from Canada and the league is a cheap diversion for a lot of them. There was one couple from Saskatchewan I spoke to both days I was there who told me that they were rooting for Team Canada even though there were no Canadians on it. Of course, at this point they're really only rooting for laundry. 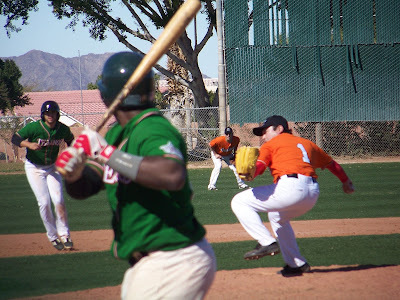 The games were interesting although frequently lopsided (one of the issues with leagues of this type and independent baseball in general is that if the pitchers were any good, they wouldn't be here). Due to the lack of crowd noise it was easy to hear the players and coaches talking to each other. 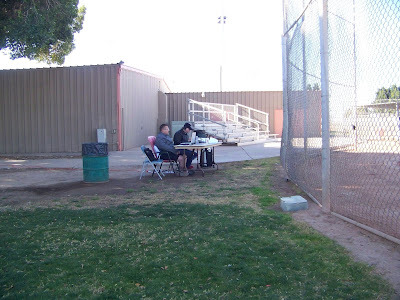 It was also easy to hear Marky Billson, the voice of the Arizona Winter League, doing play by play for the league's internet radio broadcasts from basically a card table set up behind home plate at one of the fields. 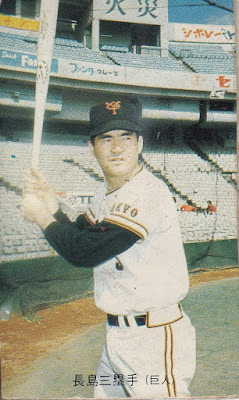 There was no PA announcer at the park so pretty much the only way to know who a player was at times was to listen to him. That's when he knew - sometimes he'd leave his table and run over to the dugout to find out who someone was. I tried to get pictures of the Japanese players. I didn't get a lot of them but I did get some. I felt kind of like a stalker actually. There's two other pictures of Japanese players that have a little story behind them. While I watched the El Paso - Yuma game on February 6th, I became aware of a bit of a commotion in the bullpen area. 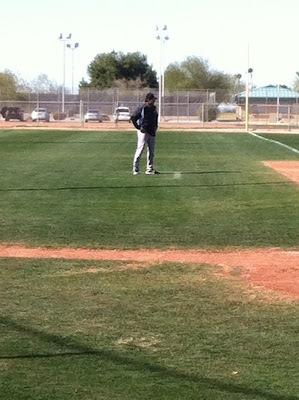 El Paso pitcher Naoki Takahashi was warming up. 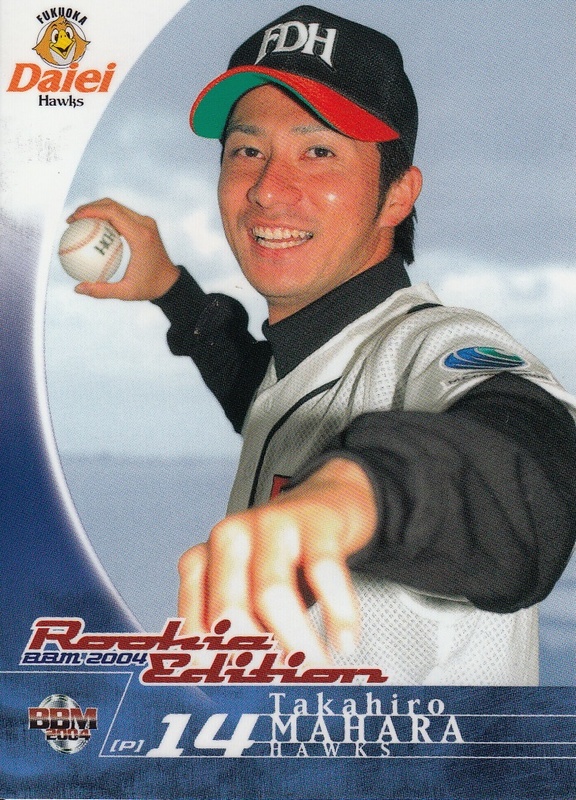 The coach was asking him how fast he could throw like that and it took me a second to realize that Takahashi was warming up left handed. Which isn't a big deal unless you happened to know that he's a right handed pitcher. 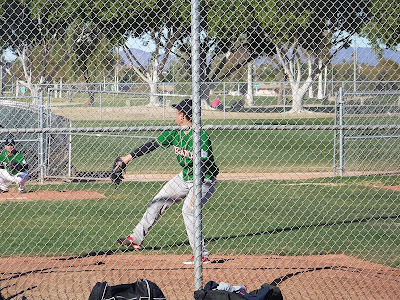 I don't know if he's pitched at all in the league as a lefty but it was fun watching him throw. 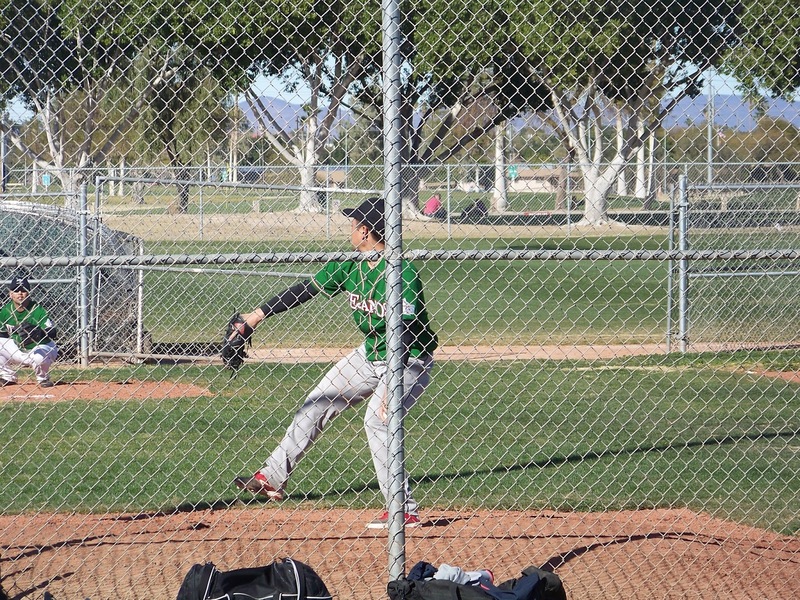 I had struggled some during the El Paso-Yuma game to try to get a good picture of Tatsuhiro Kunitomi. The sight lines at the ballpark were pretty bad for getting pictures due to the cyclone fencing between the bleachers and the fields. So I decided that I'd actually approach him after the game to get a picture. 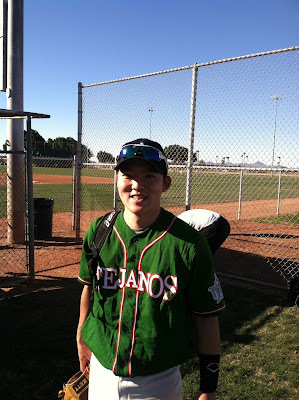 I told him I had a friend who was a Keio fan and he expressed surprise that anyone in the US had heard of Keio. We spoke for a few minutes - his English wasn't very good but it was much better than my meager (and that's being very generous) Japanese - and I wished him good luck. What was entertaining about this is that one of Kunitomi's Keio teammates is Akihiro Hakumura of the Fighters. Deanna told him that Kunitomi was in Yuma on Monday in Peoria and on Tuesday we showed him this picture. 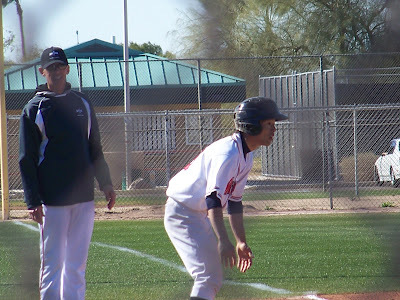 And speaking of the Fighters, I was somewhat surprised to see that on the off day they had the day after the exhibition game that Ohtani pitched (the day I was finally going home), manager Hideki Kuriyama made the three hour drive down to Yuma to visit the AWL! 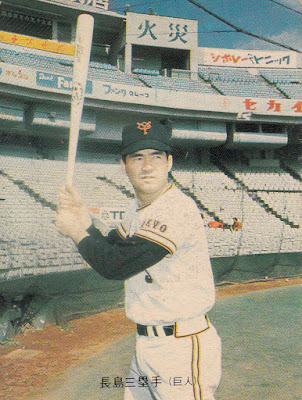 And actually it makes some amount of sense as Kuriyama played for the Swallows from 1984 to 1990 and would have trained with them in Yuma. The league has another couple days before the "regular" season ends. There will be playoffs this coming Friday and Saturday with the Championship Game on Sunday. 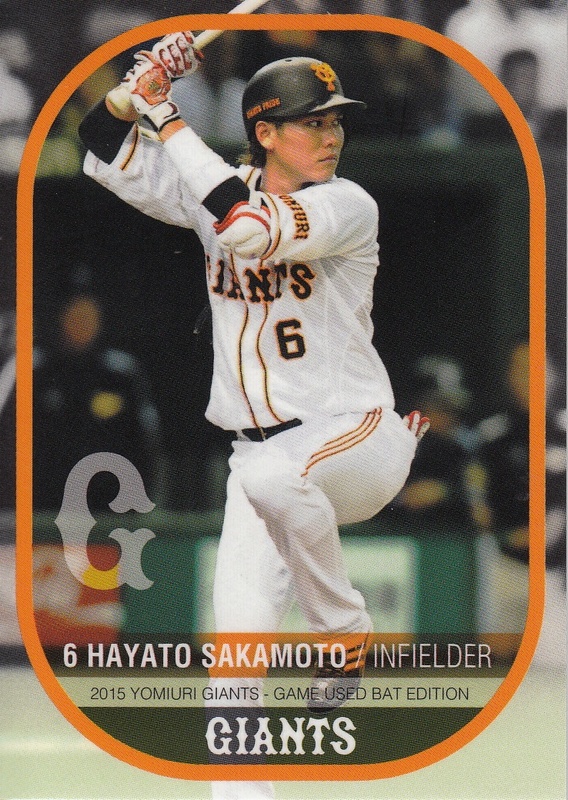 It will be interesting to see who gets signed out of the league and if any of the Japanese players end up in any major league organizations. 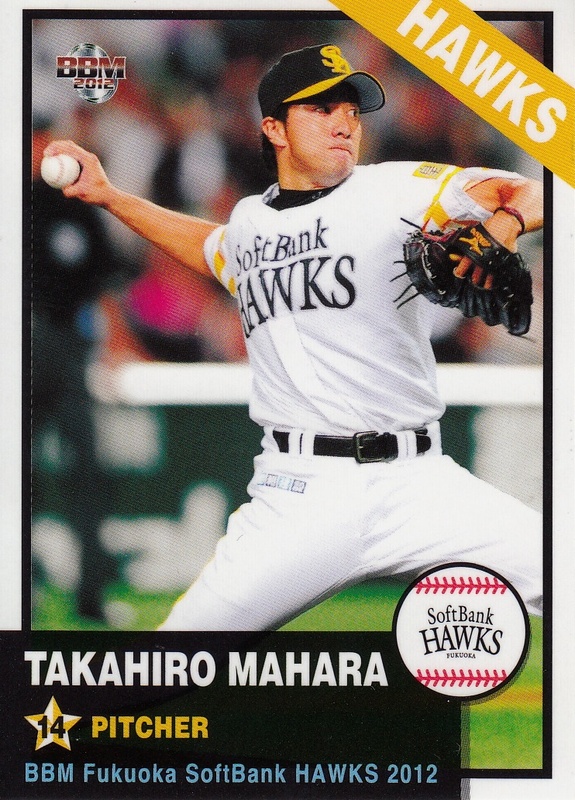 Former Hawks and Buffaloes pitcher Takahiro Mahara had announced his retirement back in early December but for some reason I didn't realize it until recently. Mahara was taken by the then Fukuoka Daiei Hawks in the "free agent phase" of the fall 2003 draft out of Kyushu Kyoritsu University. He debuted with the team as a starter in 2004 before taking over the closer role in 2005. He remained the Hawks closer through the 2011 season, missing some time in 2008 due to shoulder injury. His shoulder caused him to miss some time again in 2011 and then the entire 2012 season. 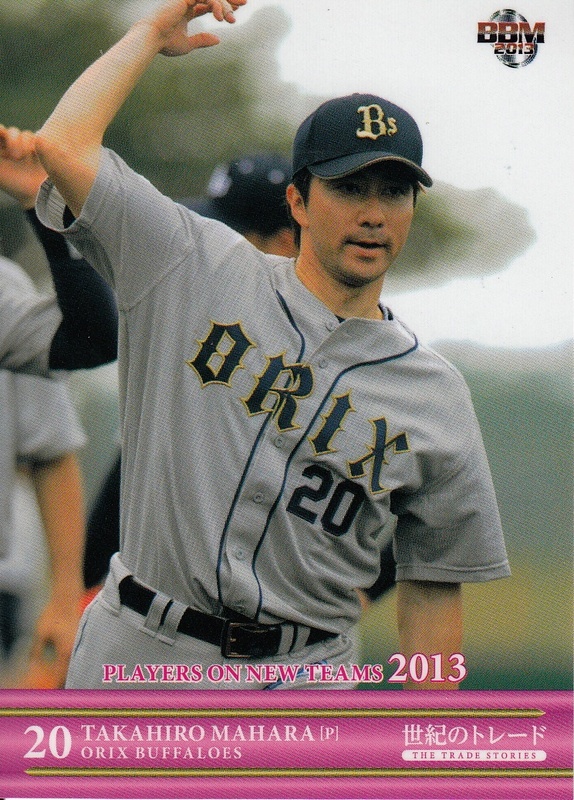 After the 2012 season, he was chosen by Orix as compensation for the Hawks signing Hayato Terahara as a free agent. 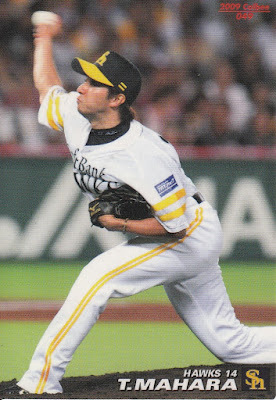 Injuries again plagued him in two of the three seasons he spent with the Buffaloes although he had a pretty good season in middle relief for them in 2014. 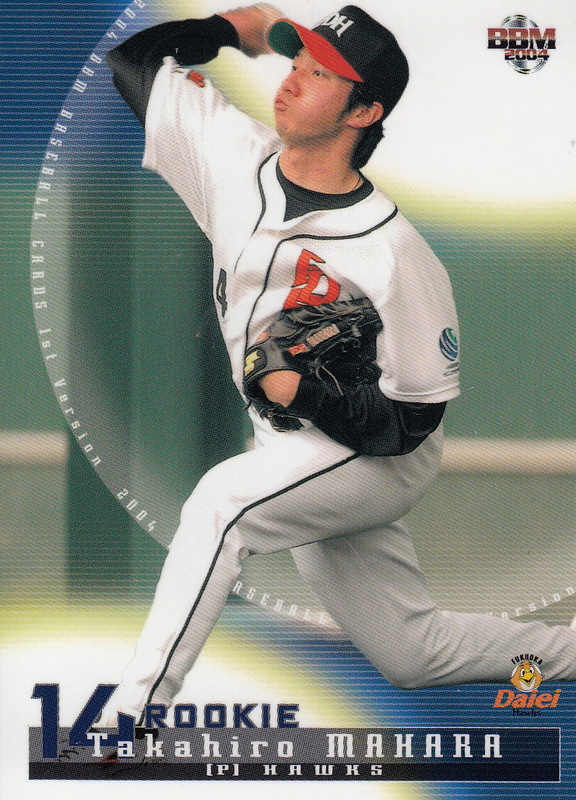 He led the Pacific League in saves with 38 in 2007. 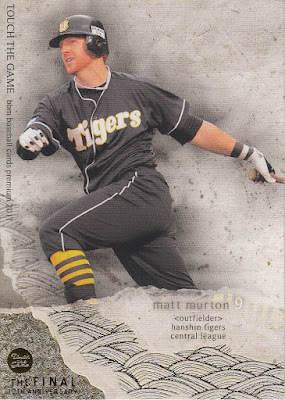 He made the All Star team three times (2006-07 & 2010). He played for the Japan National Team in the 2009 World Baseball Classic. 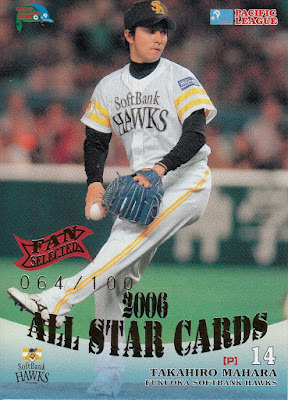 He appeared in one Nippon Series (2011, his final appearances with the Hawks).